I've been looking for art for a while and am having trouble finding anything that I really love (or that doesn't cost a fortune! ), so I decided to take a stab at DIYing something. 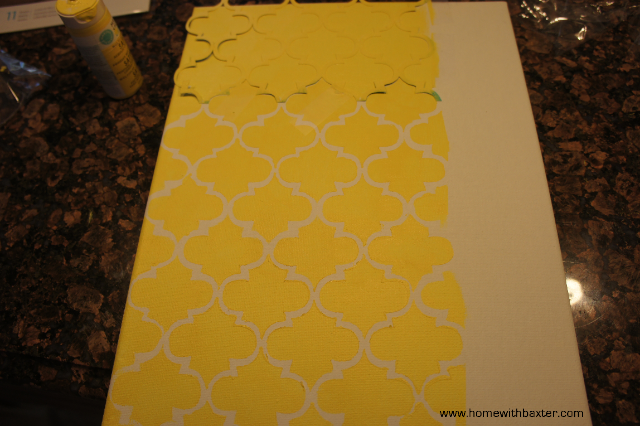 I picked up some canvas boards and some Martha Stewart stencils and got down to business. 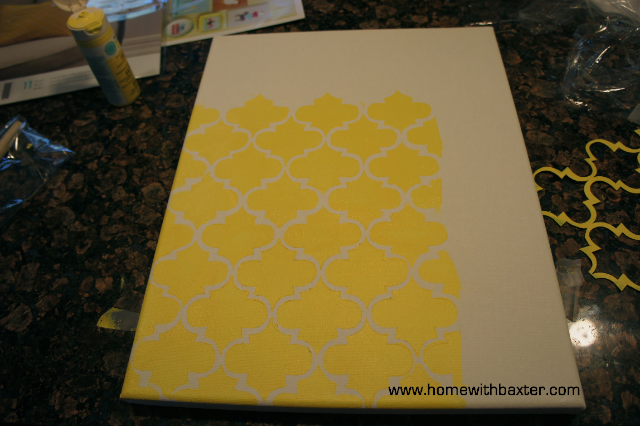 I used the Martha Stewart brand Multi-Surface Acrylic paints. I love them! They come in so many great colors and literally work on any surface. The paint worked really well with the foam brush I had too. I decided to create 4 different canvas panels. 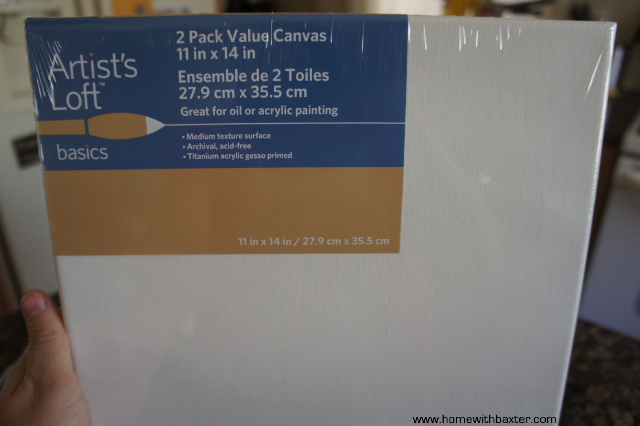 I taped the stencils onto the canvas and got to work. 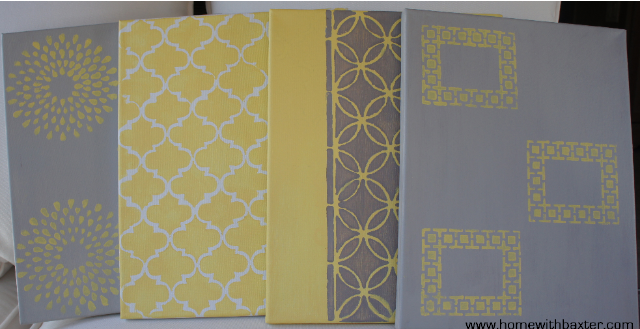 I mixed and matched colors and patterns and ended up with these 4 panels. These turned out beautifully! I'm so jealous of anyone who can stencil! I love the colors as well. Happily following you via GFC and looking forward to seeing what you do next. Found you over at 2 Yellow Birds Decor. Great project! Hi Danni, thanks! It was my first time stenciling and needless to say there are not "perfect" but that's ok. It was a great little project to start learning. Those are so pretty!!! I love all the colors! Thank you so much for sharing with us at Thursday's Temptation. Hi Jill, thanks for hosting! Those look awesome! 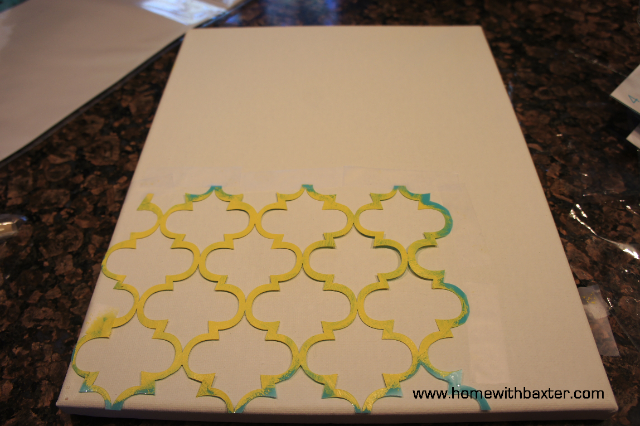 I saw those same stencils at Michael's and almost bought them a few weeks ago. Now that I've seen what you've done I might have to go back and pick them up! Thanks so much for linking up last week at Whimsy Wednesday! Just wanted to let you know I am featuring this today and pinning it on Pinterest! come on over and grab a button! Found your blog from Whimsy Wednesday. Great job! I love the grey and yellow together. I am thinking of doing this in my master bedroom. 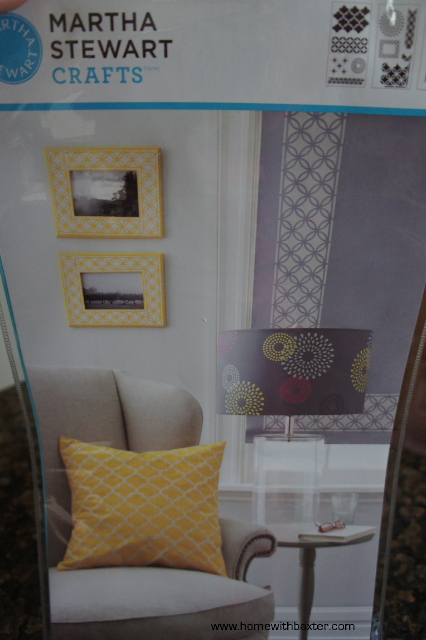 I found a lampshade at Walmart that matches one of the Martha Stewart stencils (the circle/starburst one), so I want to make some coordinating artwork. Thanks for sharing. Hi Christa, thanks! You should totally try it. It was so easy! I know I have commented on this before, but I just wanted to let you know I am featuring your cute art at today's link party! Wahoo!! Love them!! They look great Jess. These are fabulous. Great color and stencil choices. Think I'll be copying. Are the canvas's painted also or is that fabric?